This name uses Spanish naming customs: the first or paternal family name is Reina and the second or maternal family name is Páez. Reina with Napoli in 2013. * Senior club appearances and goals counted for the domestic league only and correct as of 4 September 2016. José Manuel "Pepe" Reina Páez (Spanish pronunciation: [ˈpepe ˈreina ˈpaeθ]; born 31 August 1982) is a Spanish footballer who plays as a goalkeeper for Italian club S.S.C. Napoli and the Spain national team. The son of famed FC Barcelona and Atlético Madrid goalkeeper Miguel Reina, Reina began his career with the Barcelona youth team and made his La Liga debut in the 2000–01 season. He signed for Villarreal in 2002, winning the UEFA Intertoto Cup twice. Reina moved on to Liverpool and made his debut in the 2005 UEFA Super Cup, which Liverpool won. He instantly became first-choice goalkeeper and went on to win both the FA Cup – where he saved three out of four West Ham United penalties in the final – and the FA Community Shield. In 2007, he reached the Champions League Final with Liverpool, matching the feat achieved by his father in 1974, but they lost to A.C. Milan. Following eight consecutive seasons as Liverpool's first-choice keeper, Reina spent the 2013–14 season on loan at Napoli, where he was reunited with Rafa Benítez, the coach who signed him to play for Liverpool in 2005. During his loan tenure at the Italian club, Reina was part of the side that won the 2014 Italian Cup and finished third in the domestic league. At international level, Reina played for Spain's youth team, winning the UEFA European Under-17 Football Championship in 1999. He made his senior debut in 2005, and has generally been selected as the second-choice keeper behind Iker Casillas. He was part of the Spain squad for the 2006 World Cup and made one appearance in their victorious 2008 European Championship campaign, earning him his first international honour. He was later part of the Spain squads that won their first ever World Cup in 2010 and their third European Championship in 2012, as well as playing at the 2014 World Cup. He is also the record holder for appearances by a Spanish player in the Premier League, with more than 200 appearances in just the first five seasons, 108 of the 219 appearances being clean sheets. In the 2010–11 season, he kept his 100th Premier League clean sheet for Liverpool, in a 3–0 win against Aston Villa. Reina is well known for his distribution, ball skills, shot-stopping, leadership, and ability to save penalties; he has also functioned as a "sweeper-keeper" on occasion throughout his career, due to his speed when rushing off his line. He has set a number of goalkeeping records for Liverpool and won the Premier League Golden Glove award for clean sheets in his first three seasons at the club. Son of the former FC Barcelona goalkeeper, Miguel Reina, José Manuel began his football career in the youth academy of Barcelona, La Masia. From 1997, he played as a first-choice goalkeeper for the Barcelona reserve side, which then competed in the third tier in the Spanish football pyramid. In 2000, At the age of 18, he was called up for the Barcelona first-team, after the first and second choice goalkeepers, Richard Dutruel and Francesc Arnau, suffered injuries. He made his debut as a substitute for Durtruel in a 3–3 draw with Celta de Vigo on 2 December 2000. He made 19 appearances in the remainder of the 2000–01 La Liga season and appeared seven times in the 2000–01 UEFA Cup, where Barça lost to Reina's future team Liverpool at the semi-final stage. Reina made 16 appearances for the club during the 2001–02 season, serving as understudy to Roberto Bonano. On 31 October 2001, he made his UEFA Champions League debut in Barcelona's 1–0 group stage win against Fenerbahçe at Camp Nou. After signing the German goalkeeper Robert Enke, Barcelona told Reina he was free to leave the club. In July 2002, he joined Villarreal CF and went on to spend three seasons with the Valencian club. In 2004, Villarreal reached the semi-final of the UEFA Cup and, in Reina's final season at the club, he helped El Submarino Amarillo to qualify for the Champions League for the first time in its history. Reina was signed by Liverpool from Villarreal in July 2005, with manager Rafael Benítez hailing him as "the best goalkeeper in Spain". 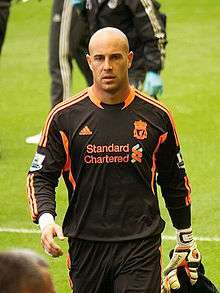 Reina made his Liverpool debut against Total Network Solutions, now known as The New Saints, in the first qualifying round for the 2005–06 UEFA Champions League. For the 2005–06 season, Reina took over as Liverpool's first-choice goalkeeper, relegating 2005 Champions League Final hero Jerzy Dudek to the bench. At the start of the season on 17 August 2005, Reina made his international debut for Spain in a friendly against Uruguay. 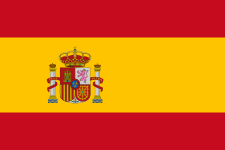 Spain won 2–0. The season turned out to be successful for Liverpool as they improved upon the previous year's league placing and won the FA Cup. It was also a huge success personally for Reina as he made Liverpool records. On 3 December 2005, Reina kept his sixth consecutive clean sheet against Wigan Athletic in the Premier League, to break the Liverpool club record for successive clean sheets in the Premier League. He surpassed David James' record of five games, from the 1996–97 season. Reina's run ended at eight league games, when James Beattie scored for Everton in Liverpool's 3–1 Merseyside derby win on 28 December 2005. Reina also broke Liverpool's clean sheet record in all competitions, with 11 between October and December 2005. Mineiro, of São Paulo, finally scored past him on 18 December 2005, during the 2005 FIFA Club World Cup final. On 5 February 2006, in a league game against Chelsea, Reina, having made a challenge on Eiður Guðjohnsen moments earlier, was sent off for violent conduct against Arjen Robben. Robben, who fell to the floor, was described as "going down like he'd been sledgehammered" by pundit Alan Hansen. Liverpool ended up losing the game 2–0 and Reina was given a three match suspension. On 16 April 2006, Reina celebrated his 50th appearance for Liverpool by keeping a clean sheet against Blackburn Rovers. As a result, he holds a Liverpool record for the fewest goals conceded by a goalkeeper in his first 50 games. The previous record was set by Ray Clemence in 1970–71, when he conceded 32 goals. Reina conceded just 29. In May 2006, Reina was awarded the Premier League's Golden Glove award for keeping 20 clean sheets in the 2005–06 season. In the final domestic game of the season – the 2006 FA Cup Final on 13 May 2006 – Reina made a number of errors to allow West Ham United to lead 3–2. Steven Gerrard took the match to extra time with a late equaliser. The match ended 3–3 and went to penalties, where Reina saved three out of four penalties to gain the cup win. During the 2006–07 season, despite making early season errors (most notably against Liverpool city rivals Everton in a 3–0 defeat), Reina's status as Liverpool's number-one keeper was further cemented by Dudek's conceding nine goals within a week in two cup ties against Arsenal. After the 2007 Champions League semi-final first-leg against Chelsea, Reina was awarded man of the match by Liverpool supporters thanks to a string of superb saves, including two saves from midfielder Frank Lampard. He repeated his good form in the second leg, keeping a clean sheet. The match went to a penalty shootout, where Reina reinforced his penalty-saving reputation, stopping two of the three Chelsea kicks as Liverpool won 4–1. On his return home from the match, he discovered his house in Woolton had been burgled. Three weeks later in Athens, Reina became only the third player to follow in his father's footsteps by appearing in a European Cup final. Liverpool failed to win their sixth trophy, losing 2–1 to A.C. Milan. Reina signed a new five-year contract Liverpool on 7 June 2007. In August 2007, Reina again won the Premier League's Golden Glove Award for the second successive season, after keeping 19 clean sheets in the 2006–07 Premier League campaign. Reina began the season by saving a penalty from Portsmouth's Nwankwo Kanu to help his team to a 0-0 draw. On 2 February 2008, Reina became the quickest goalkeeper in Liverpool history to keep a half century of clean sheets. He hit the milestone during a 3–0 win against Sunderland, on his 92nd league outing, beating the previous record by three. He played all 38 Premier League matches for Liverpool and won his third consecutive Golden Glove award with 18 clean sheets. Reina played every minute of Liverpool's 2008–09 Premier League season, keeping 20 clean sheets, as the team finished as league runners-up with 80 points. On 22 March 2009, Reina kept his 100th clean sheet for Liverpool in a Premier League match against Aston Villa. During the match, he assisted a goal for Albert Riera with a long pass in Liverpool's 5–0 win. Reina again played all 38 matches during the 2009–10 Premier League season, keeping 17 clean sheets. He tied with Petr Čech for the Golden Glove award for the season, but Čech was awarded the trophy with a better goals to game ratio. He was named as Liverpool's Player of the Season for 2009–10 with 75% of the vote. On 17 October 2009, Liverpool were beaten 1–0 by Sunderland with a goal from Darren Bent, which was deflected past Reina via a beach ball thrown from the crowd. In April 2010, Reina signed a new six-year contract with Liverpool. Reina got his 2010–11 season off to a poor start, with a late own goal to give Arsenal a 1–1 draw in Liverpool's opening Premier League fixture. Manager Roy Hodgson, club captain Steven Gerrard and vice-captain Jamie Carragher were all quick to get behind Reina and back him to not let the mistake affect his season. Reina captained the team in Europa League matches against Napoli and FC Steaua București due to the absences of Steven Gerrard and Jamie Carragher. On 6 December 2010, Reina captained Liverpool in the Premier League in a 3–0 victory against Aston Villa. This clean sheet gave him his 100th in 198 league matches, the fastest Liverpool keeper to reach this landmark. On 9 May 2011, Reina played his 150th consecutive league game for Liverpool. He was one of only two players to have played in all of Liverpool's league games for 2010–11 season. In June 2011, Reina underwent double hernia surgery. Reina announced on 3 September 2011 that he wanted to stay at Liverpool for another five or six years. On 29 November 2011, Reina broke the club record for most clean sheets in a 2–0 Football League Cup quarter-final win over Chelsea. The record had previously been held by Ray Clemence and Bruce Grobelaar. On 26 February 2012, Reina won his second major honour with Liverpool, beating Cardiff City on penalties in the 2012 Football League Cup Final. On 1 April 2012, Reina received a red card in a 2–0 defeat against Newcastle United due to violent conduct on Newcastle player, James Perch. Reina's suspension ended his streak of 183 consecutive Premier League appearances which had begun in August 2007. He missed Premier League matches against Aston Villa and Blackburn Rovers, as well as the FA Cup semi-final against Everton on 14 April. On 5 May, he started for Liverpool in their 2–1 2012 FA Cup Final defeat to Chelsea. On 30 August 2012, Reina made a mistake in a 1–1 draw against Heart of Midlothian in the Europa League to give the Edinburgh club the lead at Anfield. He made another error against Manchester City at the City of Manchester Stadium, allowing Sergio Agüero to score a late equaliser in a 2–2 draw on 3 February 2013. Towards the end of the 2012–13 season, rumours suggested that Víctor Valdés was to leave Barcelona for Monaco and Reina was to be his replacement. According to his father, an agreement had been reached for Reina to sign, but when Valdés chose to stay at Barcelona for another season, no move took place. In anticipation of Reina's departure, Liverpool had signed Belgian international keeper Simon Mignolet from Sunderland. As a result, on 29 July 2013, Reina completed a loan move to Serie A side Napoli, a move that reunited him with his former Liverpool manager Rafael Benítez. Reina was loaned out to Napoli for the 2013–14 season. Liverpool failed to tell Reina about the loan prior to the move. He had made 394 appearances for Liverpool prior to the loan. In August 2013, he saved a penalty from Lukas Podolski against Arsenal in the pre-season Emirates Cup tournament, and in September, in a 2–1 win over Milan in September, he saved a Mario Balotelli penalty, the first goalkeeper ever to do so in a competitive match. On 28 September, Reina declared that his Liverpool career was over: "At the moment it's difficult to think about being a Liverpool player next year. They have a young goalkeeper in Simon Mignolet and the manager prefers him to me. That's the reason why I'm here and he will be at the club next year as well. There's no reason to think I'll be a Liverpool player from now on but we'll see where the future takes us. It's been a good move so far and I don't regret what happened. I would have preferred to say goodbye in a different way." On 3 May 2014, Reina won the Coppa Italia with Napoli in a 3–1 win against Fiorentina. On 8 August 2014, Liverpool confirmed that Reina had joined the German club FC Bayern Munich on a three-year deal, bringing an eight-year spell with the club to an end. He wore the number 23 jersey for Bayern, the same number he wears for the Spain national team. On 14 March 2015, Reina made his debut for Bayern, starring in a 4–0 away win against Werder Bremen. His appearance in that match meant that he became the first goalkeeper and Spaniard in history to play in four of Europe's top leagues: Spain, England, Italy and Germany. On 9 May, as Bayern had already won the league and had a Champions League semi-final second leg against Barcelona to come, regular goalkeeper Manuel Neuer was rested for their home match against FC Augsburg and Reina started. He was given a straight red card after 14 minutes when he conceded a penalty with a foul on Raúl Bobadilla; Neuer came on in place of Philipp Lahm but Paul Verhaegh hit the post for Augsburg, who eventually won 1–0. 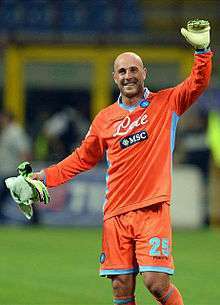 On 23 June 2015, it was announced that Reina would return to Napoli on a three-year deal, after a one-year spell at Bayern Munich. Reina has been a regular in the Spain national team since 2005, mostly as second-choice keeper after Iker Casillas. He was part of the team that won the 2010 FIFA World Cup and the 2008 and 2012 European Championships. He made his debut on 17 August 2005, keeping a clean sheet in a 2–0 friendly win over Uruguay at El Molinón in Gijón. He was a member of the Spanish squad which reached the last 16 of the 2006 FIFA World Cup, but did not play. At UEFA Euro 2008, he played the final group game in Salzburg as Spain had already advanced, conceding a header by reigning champion Greece's Angelos Charisteas, although Spain came back to win 2–1. In October 2008, he and Casillas together broke the national record for the longest time spent without conceding a goal after defeating Estonia 3–0. The pair went unbeaten for 710 minutes since Reina conceded from Charisteas, longer than the legendary Andoni Zubizarreta and Francisco Buyo. Wesley Sonck of Belgium ended their streak when he scored against Casillas in a World Cup qualifier later that month. The following year, he was part of the Spanish squad which reached the semi-finals at the Confederations Cup in South Africa. His sole appearance was in the last group game in Bloemfontein, keeping a clean sheet in a 2–0 win over the hosts, a result which was a world record 15th consecutive international victory for Spain. Reina was also in Spain's squad for the 2013 FIFA Confederations Cup, in which they reached the final. His sole appearance in the tournament came in the second group game against Oceanian champions Tahiti, a 10–0 win at the Maracanã. With Spain's elimination already confirmed, he was selected to start in Spain's final group match of the 2014 FIFA World Cup keeping a clean sheet against Australia in a 3–0 win. Reina married his longtime girlfriend, Yolanda Ruiz, in Córdoba on 19 May 2006, before joining up with the Spanish national squad for the 2006 FIFA World Cup. The couple have five children. Reina was the former next door neighbour of Atlético Madrid striker and Spanish international teammate Fernando Torres. When he was at Liverpool, he was neighbours with teammate Luis Suárez. He also used to live next door to Maxi Rodríguez before Maxi returned to Argentina. His father Miguel Reina was in goal for Atlético Madrid in the 1974 European Cup Final which they lost to FC Bayern Munich 4–0 in a replay after the first match finished 1–1. Although a steely and serious figure as goalkeeper, Reina is known for his exuberant, jester-like character off the pitch, often entertaining his teammates with jokes and songs, and famously acting as a crowd-pleasing master of ceremonies at Spain's official victory celebrations following the 2008 European Championship, the 2010 World Cup and the 2012 European Championship. Reina is a very close friend of his Spanish international teammate David Villa. They can often be seen spending time together or celebrating victories. As of 15 May 2016. ↑ "FIFA World Cup South Africa 2010: List of Players" (PDF). Fédération Internationale de Football Association (FIFA). 4 June 2010. p. 29. Retrieved 13 September 2013. ↑ "Josè ManuelReina". SSC Napoli (in Italian). Retrieved 2 July 2015. ↑ "Players". premierleague.com. Retrieved 8 August 2014. ↑ Lorenzo Bettoni (25 January 2016). "Gigi Buffon announces he will retire after the 2018 FIFA World Cup". calciomercato. Retrieved 15 April 2016. ↑ Alex Hess (18 March 2015). "Pepe Reina: the semi-tragic tale of a keeper in all the right places at the wrong times". FourFourTwo. Retrieved 15 April 2016. ↑ Tony Morgan (19 July 2013). "Benitez Seeks Napoli Reunion With Liverpool Shot Stopper - Report". International Business Times. Retrieved 15 April 2016. ↑ Duncan White (26 November 2011). "Liverpool goalkeeper Pepe Reina believes club are on the right road to fulfilling their Europe dream". The Telegraph. Retrieved 15 April 2016. 1 2 3 4 "Biography". pepereina25.com. Retrieved 21 April 2014. ↑ "Liverpool 1 v 0 Barcelona". The Guardian. 20 April 2001. Retrieved 21 April 2014. ↑ "Barcelona 1-0 Fenerbahçe". UEFA. Retrieved 21 April 2014. ↑ "Reina seals Villarreal move". BSkyB. Retrieved 21 April 2014. ↑ "Reina still keen for Anfield move". BBC. 18 June 2005. Retrieved 21 April 2014. ↑ Stevenson, Jonathan (23 February 2006). "Mourinho in a mess". BBC News. Retrieved 7 May 2010. ↑ "Reina pens new Liverpool contract". BBC Sport. 7 June 2007. Retrieved 7 June 2007. ↑ "Reina nets goalkeeping award". Retrieved 10 October 2014. ↑ "Portsmouth 0-0 Liverpool". BBC. 15 September 2007. Retrieved 15 September 2015. ↑ "José Manuel breaks Anfield record". Archived from the original on 24 May 2008. Retrieved 3 February 2008. 1 2 "Why Pepe Reina's 'decline' may be Liverpool's fault and Arsenal's gain". TalkSport. 5 December 2012. Retrieved 21 April 2014. 1 2 "Liverpool F.C. v Swansea Preview: Pepe Reina on brink of another Reds landmark". Liverpool Echo. 5 November 2011. Retrieved 21 April 2014. ↑ "Liverpool keeper Reina on top of the world for Anfield skipper Gerrard". Daily Mail. 31 March 2009. Retrieved 21 April 2014. ↑ McNulty, Phil (22 March 2009). "Liverpool 5-0 Aston Villa". BBC. Retrieved 2 July 2015. 1 2 "Reina crowned Player of 09-10". Liverpool F.C. 11 May 2010. Retrieved 21 April 2014. ↑ "Sunderland 1 - 0 Liverpool". BBC. 17 October 2009. Retrieved 21 April 2014. ↑ "Pepe Reina signs new six-year deal at Liverpool F.C.". dailypost.co.uk. ↑ "Hodgson backs Reina after blunder". BBC News. 15 August 2010. ↑ "Stevie: Reina will make up for it – Liverpool F.C.". Liverpoolfc.tv. 16 August 2010. Retrieved 26 May 2012. ↑ "Reina to skipper Reds – Liverpool F.C.". Liverpoolfc.tv. 1 December 2010. Retrieved 26 May 2012. ↑ "Reina's ton good". BSkyB. 10 December 2010. Retrieved 21 May 2014. ↑ "Kenny: Reina's the world's best". Liverpool F.C. 17 May 2011. Retrieved 21 April 2014. ↑ "Liverpool optimistic for pre-season after José Reina's hernia surgery". The Guardian. 13 June 2011. Retrieved 21 April 2014. ↑ "Kenny Dalglish upbeat over fitness of Gerrard and Reina". BBC Sport. 11 July 2011. Retrieved 12 July 2011. ↑ "Pepe Reina". UEFA. Retrieved 21 April 2014. ↑ "Reds win Carling Cup on penalties". ESPN Soccernet. 26 February 2012. Archived from the original on 29 February 2012. Retrieved 11 April 2012. ↑ "Liverpool take an April fall". ESPN Soccernet. 1 April 2012. Archived from the original on 6 April 2012. Retrieved 11 April 2012. ↑ "Newcastle 2-0 Liverpool". BBC. 1 April 2012. Retrieved 21 April 2014. ↑ "Liverpool's Glen Johnson blames James Perch for Pepe Reina's suspension". The Telegraph. 2 April 2012. Retrieved 21 April 2014. ↑ "Chelsea 2-1 Liverpool". BBC. 5 May 2012. Retrieved 21 April 2014. ↑ "Liverpool 1 Heart of Midlothian 1; 2-1 agg: match report". The Telegraph. 30 August 2012. Retrieved 21 April 2014. ↑ "Brendan Rodgers says Liverpool are 'bitterly disappointed' following Jose Reina 'mistake'". The Independent. 3 February 2013. Retrieved 21 April 2014. ↑ "'Reina had an agreement with Barcelona'". Marca. 11 August 2013. Retrieved 14 May 2014. ↑ Oscroft, Tim (26 July 2013). "Brendan Rodgers explains Napoli loan move for Liverpool keeper Pepe Reina". Sky Sports. Retrieved 14 May 2014. ↑ "Reds confirm Pepe Reina loan move". Liverpool F.C. 29 July 2013. Retrieved 14 May 2014. ↑ "Liverpool's Pepe Reina regrets manner of Napoli move". BBC Sports. 29 July 2013. Retrieved 6 August 2014. ↑ "Pepe Reina: Liverpool keeper set to move to Bayern Munich". BBC Sports. 5 August 2014. Retrieved 6 August 2014. ↑ Burnton, Simon (3 August 2013). "Arsenal turn boos to cheers after coming back to draw with Napoli". The Observer. Retrieved 3 September 2014. ↑ Bandini, Paolo (23 September 2013). "Mario Balotelli's miss overshadows Rafael Benítez's Napoli revolution". The Guardian. Retrieved 3 September 2014. ↑ Barlow, Matt (27 September 2013). "Pepe Reina exclusive: My Liverpool days are over, I'll never go back". Daily Mail. London. Retrieved 8 August 2013. ↑ "Insigne brace seals Coppa". ESPN. 3 May 2014. Archived from the original on 4 May 2014. Retrieved 7 May 2014. ↑ "Reina joins Bayern Munich". Liverpool F.C. 8 August 2014. Retrieved 8 August 2014. ↑ "Reina inks three-year deal". FC Bayern Munich. 8 August 2014. Retrieved 8 August 2014. ↑ "SV Werder Bremen 0-4 Bayern Munich". BBC Sport. 14 March 2015. Retrieved 14 March 2015. ↑ Mahoney, Tony (14 March 2015). "Pepe Reina the first goalkeeper to play in Europe's big four leagues". goal.com. Retrieved 15 March 2015. ↑ Bhardwaj, Vaishali (14 March 2015). "Pepe Reina becomes first goalkeeper to play in all four of Europe's top leagues after Bayern Munich start against Werder Bremen". metro.co.uk. Retrieved 15 March 2015. ↑ Redmond, Robert (14 March 2015). "Pepe Reina broke a few records by starting for Bayern Munich today". sportsjoe.ie. Retrieved 15 March 2015. ↑ "Bayern Mun 0-1 FC Augsburg". BBC Sport. 9 May 2015. Retrieved 9 May 2015. ↑ "Pepe Reina al Napoli" [Pepe Reina to Napoli] (in Italian). S.S.C. Napoli. 23 June 2015. Retrieved 23 June 2015. ↑ "España vence 2-0 a Uruguay en amistoso" [Spain win 2-0 against Uruguay in a friendly]. El Universo (in Spanish). Associated Press. 17 August 2005. Retrieved 16 April 2015. ↑ McKenzie, Andrew (18 June 2008). "Russia 2-0 Sweden & Greece 1-2 Spain". BBC Sport. Retrieved 16 April 2015. ↑ "Bélgica pone fin a la imbatibilidad de España" [Belgium put a stop to Spain's inpenetrability] (in Spanish). Marca. 15 October 2008. Retrieved 16 April 2015. ↑ "Spain 2-0 South Africa". BBC Sport. 20 June 2009. Retrieved 16 April 2015. ↑ Magowan, Alistair (20 June 2013). "Spain 10-0 Tahiti". BBC Sport. Retrieved 16 April 2015. ↑ "Australia 0-3 Spain". BBC. 23 June 2014. Retrieved 24 June 2014. ↑ "WAGS – Yolanda Ruiz, Wife Of Pepe Rein". totalfootballmadness.com. 11 May 2010. Retrieved 8 August 2014. 1 2 Lowe, Sid (5 March 2011). "I'm happy but I won't swear eternal love to anyone, says Pepe Reina". Guardian. Retrieved 10 October 2014. ↑ FCule (30 June 2008). "Pepe Reina SUPERLOCO en el avión!". Retrieved 21 June 2016 – via YouTube. ↑ TodosConLaRoja (12 July 2010). "Reina sings to Casillas and Sara in the plane. - Celebración en el avión.". Retrieved 21 June 2016 – via YouTube. ↑ Luis Sanchez (13 September 2008). "Pepe Reina y la presentación de los campeones.". Retrieved 21 June 2016 – via YouTube. ↑ "YouTube". Retrieved 21 June 2016. ↑ DumaKataloniiPL (4 July 2012). "Pepe Reina Show Euro 2012 cz. 1". Retrieved 21 June 2016 – via YouTube. ↑ QIFanGirl (26 July 2010). "Bromance - David Villa & Pepe Reina". Retrieved 21 June 2016 – via YouTube. ↑ "they can't get enough of each other!". 27 July 2010. Retrieved 21 June 2016. ↑ TheWorldCrack (13 July 2010). "David Villa,Sergio Ramos y Pepe Reina Borrachos en el avion". Retrieved 21 June 2016 – via YouTube. ↑ "Pepe Reina". European Football. Retrieved 16 April 2015. 1 2 3 4 "Pepe Reina". Soccerway. Retrieved 17 August 2014. ↑ "Gladbach wieder Dritter - FC Bayern ist Meister" [Gladbach third again - FC Bayern are champions] (in German). kicker. 26 April 2015. Retrieved 26 April 2015. ↑ "Royal Order of Sporting Merit 2011". Wikimedia Commons has media related to Pepe Reina.